HowMechanismWorks ? : What is Electromagnetic Radiation ? What is Electromagnetic Radiation ? Electromagnetic energy is a term used to describe all the different kinds of energies released into space by stars such as the Sun. Electromagnetic radiation is commonly referred to as "light", EM, EMR, or electromagnetic waves. The waves propagate through a vacuum at the speed of light. The oscillations of the electric and magnetic field components are perpendicular to each other and to the direction in which the wave is moving. The waves may be characterized according to their wavelengths, frequencies, or energy.Sunlight is also a form of EM energy, but visible light is only a small portion of the EM spectrum, which contains a broad range of electromagnetic wavelengths. All these waves do different things (for example, light waves make things visible to the human eye, while heat waves make molecules move and warm up, and x rays can pass through a person and land on film, allowing us to take a picture inside someone's body) but they have some things in common. They all travel in waves, like the waves at a beach or like sound waves, and also are made of tiny particles. Scientists are unsure of exactly how the waves and the particles relate to each other. The fact that electromagnetic radiation travels in waves lets us measure the different kind by wavelength or how long the waves are. That is one way we can tell the kinds of radiation apart from each other. Although all kinds of electromagnetic radiation are released from the Sun, our atmosphere stops some kinds from getting to us. For example, the ozone layer stops a lot of harmful ultraviolet radiation from getting to us, and that's why people are so concerned about the hole in it. 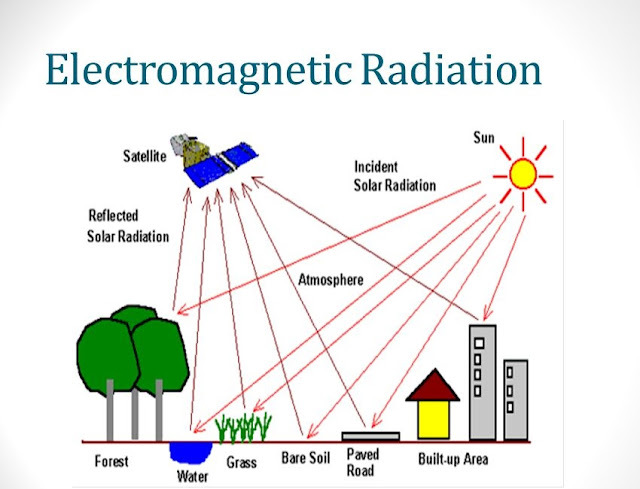 We humans have learned uses for a lot of different kinds of electromagnetic radiation and have learned how to make it using other kinds of energy when we need to. DS1 would not be able to communicate with Earth, for example, if it could not produce radio waves. What is Electromagnetic Theory ? Electricity and magnetism were once thought to be separate forces. However, in 1873, Scottish physicist James Clerk Maxwell developed a unified theory of electromagnetism. The study of electromagnetism deals with how electrically charged particles interact with each other and with magnetic fields. The force of attraction or repulsion between electric charges is inversely proportional to the square of the distance between them. Magnetic poles come in pairs that attract and repel each other, much as electric charges do. An electric current in a wire produces a magnetic field whose direction depends on the direction of the current. Maxwell also developed a set of formulas, called Maxwell's equations, to describe these phenomena.